You know that bit in KungFu Panda where Po’s dad is waiting for Po to have the noodle dream so he can become a real noodle chef? Well I had the fruitcake dream. It was a sign. It was time to go forth and buy glacé cherries. This isn’t one of this cakes you accept graciously from your auntie, wait six months, then throw it in the compost. Actually, I don’t get that whole giving people fruitcake. Despite the fact that this one is delicious, I do understand that it isn’t for everyone. 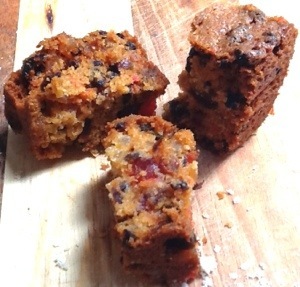 I do give out fruitcakes, but only to people who ask. Not only ask, because I’ll just assume they’re being polite and really don’t want to hurt my feelings, but actually beg. I was going to send half of this one to my grandma, as she’s a big fan of it, but there isn’t enough left after yesterday’s barbeque. She’ll have to wait for the next one to come along. I know I go on about the best ingredients a bit, but that’s because it is important and I really want you to understand it and go to your own local markets and buy the best you can find. I also want the major supermarkets to go broke, so I only buy cat food, toilet paper and jumbo boxes of breakfast cereal from them, but that’s a rant for another day. This recipe is just fruit, and cake, so you want terrific fruit. Place in your largest mixing bowl 250 grams of butter (or two sticks if you’re a non SI American, see Donna Hay, two can play at that game), and cream it with the zest of a lemon and a cup of sugar. If you want a golden crumb, use caster sugar. If you like it a bit darker and richer, go half caster and half brown. I might try using dark brown next time, if I’m feeling crazy. Beat in four eggs, one at a time. Now for the fruit. Tip in 250 grams sultanas, 125 grams currants, 125 grams of mixed peel (have a hunt through the archives for a method to make your own) and 125 grams glacé cherries. I have used very fancy semi dried cherries for this in the past, but I do have a soft spot for green Big Sister cherries like Nanna used to use. The next 250 grams of dried fruit are at your discretion, but my favourite mix is 125 grams chopped crystallized ginger and 125 grams of the very zingy dried cranberries that are purveyed by Honest to Goodness. If you don’t use ginger, add a tablespoon of ground ginger when adding the flour. I’ve also used dried apricots, crystallized pineapple (who just thought of Professor Slughorn? ), glazed figs and dates (I find the last two not acidic enough, but each to their own). Mix the fruit in with the butter and egg, this will take some elbow work. Then add a cup and a half of flour and a tablespoon of baking powder and mix that in. Scrape this lot into a cake tin lined with baking paper, mine is 20 by 20 cm. It doesn’t rise very much, so don’t worry that it almost fills the tin. Bake at 150 degrees Celsius for really quite some time. The original Woman’s Weekly recipe that I based this on says three hours, but mine usually take a bit less than that. Keep an eye on it, it will be a rich gold on top and a bit crunchy looking. Stick a skewer in it, if it comes out clean then take it out. I like it to cool out of the tin because the outsides get nice and firm.